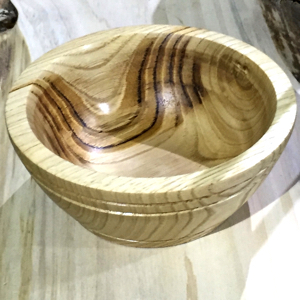 It was beyond exciting, and somewhat scary, when I decided to try my hand at wood turning on a lathe. It is hard to believe you start with a ‘blank’, or lump of wood that you can carefully turn into something beautiful. Amazing too that you can use a microwave to dry out the wood. Far more interesting than baking a potato! Many thanks to Sam who taught me this new skill at a Meetup in his amazing garden workshop.